In a large skillet heat olive oil over medium heat. Add onion and saute for 10 minutes. Add celery and saute another 5 mintues. 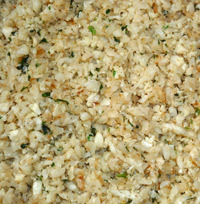 Meanwhille, place cauliflower in a food processor and process intil it’s the texture of rice. Add cauliflower to the skillet, cover and cook for about 10 minutes until it’s soft, then add salt. This entry was posted in Metabolic Medical Center Recipes, Vegetables and tagged cauliflower, celery, healthy tips, not really rice, onion, rice, side dish, Vegetable, vegetarian by foodies4mmc. Bookmark the permalink.